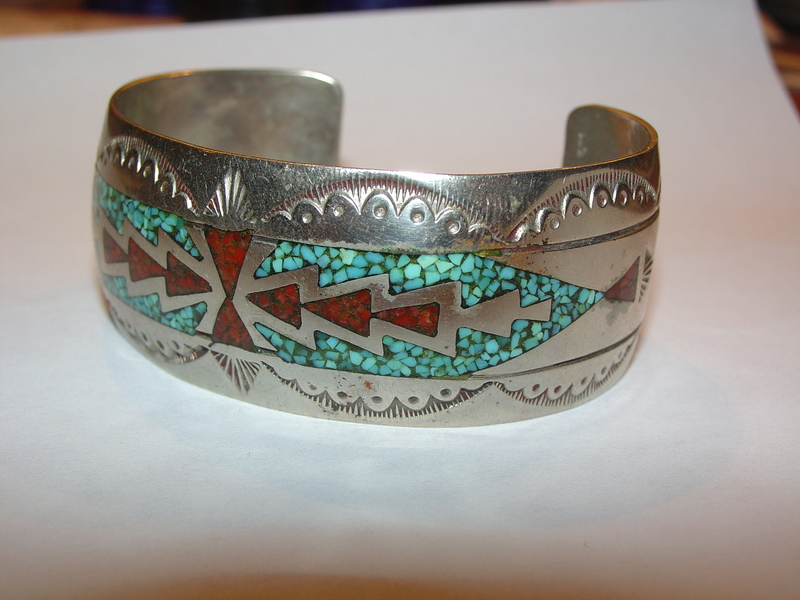 I have a piece that is SS with turquoise chip inlay. The hallmark is TC with a S over the C. I’ve been told it may be Tommy Singer’s work. I would like to track down the artist. Can you help? In The Little Book of Marks on Southwestern Silver by Bille Hougart (2011) that hallmark is shown in a photo and is attributed to Tommy Singer. What tribe are these rings from and when? I wear these rings daily. They are my personal rings and are just wondering when and what tribe they may be from. Was told dates between 1930 and 1950. Nothing confirmed on tribe. 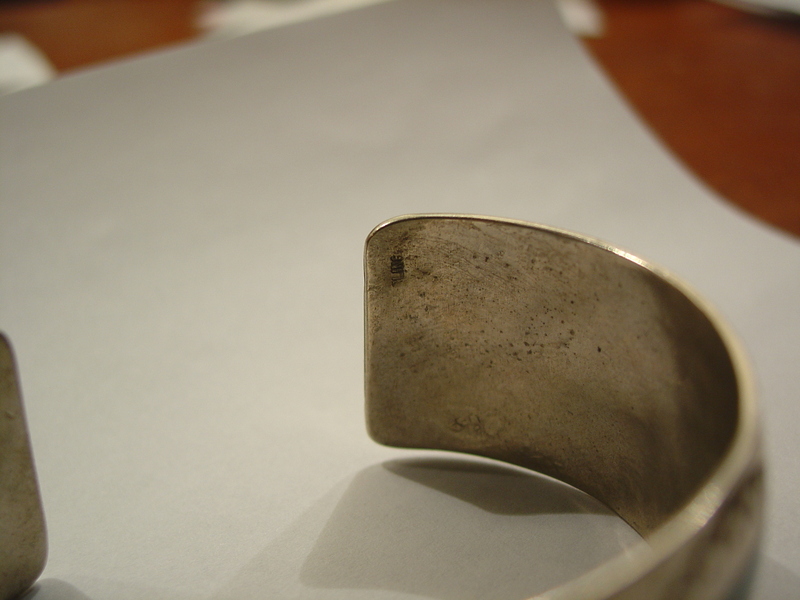 No markings inside band just silver folding marks on ring without the coral. 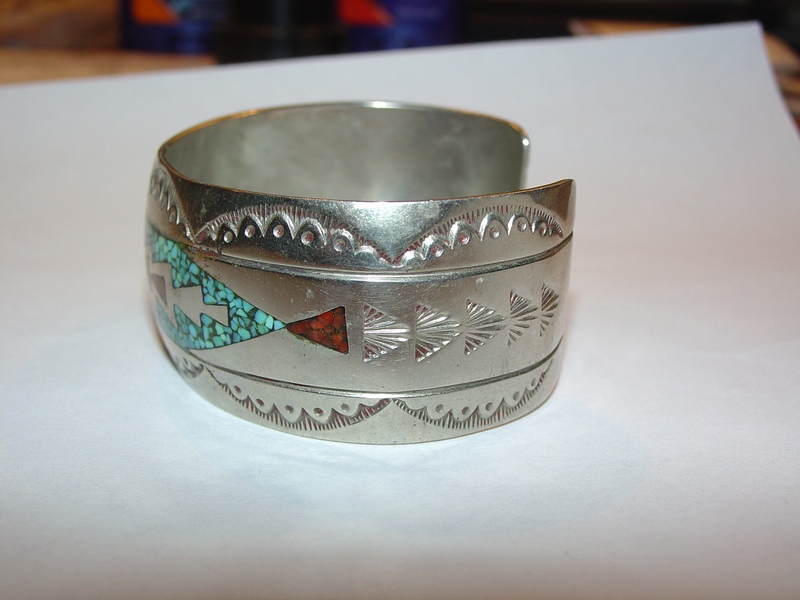 These chip inlay rings look like they are Navajo made. As to when they were made, well since chip inlay techniques are said to have been invented in the 1960s by Tommy Singer , these rings are probably from after that, most likely 1970s or later. We have some rings very similar to these in our pawn shop . Is this chip inlay pin pendant an early Tommy Singer piece? In researching a silver piece I own, I came upon your blog. I’m trying to find out if the combo brooch/pin/pendant is by the silversmith Tommy Singer. The design has chip inlay. On the back, there is a capital “T” hallmark. I understand this might be an earlier hallmark. Judging from the photos you sent, it looks like early Tommy Singer chip inlay of a yei figure. The Little Book of Marks on Southwestern Silver by Bille Hougart.